Arthur Ashe was spared from serving in Vietnam, allowing his tennis career to blossom. Bills lineman Kalsu elected to serve, and his family is still feeling the impact of his death. There are some who remember Bob Kalsu as a football star. In 1967, he was an All-American offensive tackle for a 10-1 Oklahoma team that beat Tennessee in the Orange Bowl. The next spring, he was drafted in the eighth round by the Buffalo Bills, and by the end of his first season he’d been elected the team’s rookie of the year. There are others who remember him as a soldier. At Oklahoma, Kalsu had completed ROTC, and he graduated in May 1968 with a commitment to Army service. 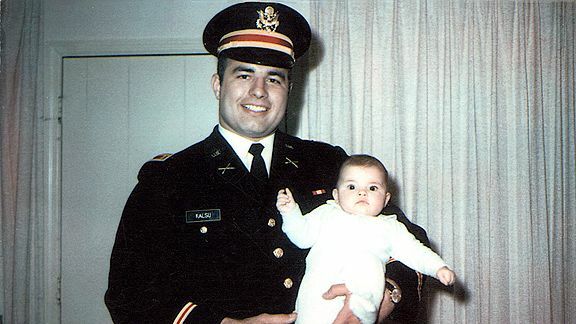 Sixteen months later, with his daughter just 10 months old, he was called to Vietnam. At the time, many professional athletes used their standing to avoid active duty and serve as reserves instead. It was a choice Kalsu’s friends urged him to take, but one he declined. On July 21, 1970, Bob Kalsu was killed at Firebase Ripcord, on a hill in South Vietnam’s Thua Thien-Hue province. He would be the only professional athlete to die in Vietnam. He was 25 years old. Less than two days later, just after midnight on July 23 in Oklahoma City, James Robert Kalsu Jr. was born. There’s a painting Bob Jr. remembers from his parents’ home. It was of his father in his Oklahoma football uniform, and as a child, it was the image he held. When he would fall asleep to the sound of his father’s voice, he would picture a giant man in a jersey, leaning down from the clouds. Both he and Jill mention that when they started school they began to notice what it meant to lose, and never meet, a dad. “I think you start really understanding the magnitude of what it’s like to not have your father,” Bob Jr. says. “You start to see other people’s fathers at your ballgames, and there are other instances when you see fathers around, and you realize you’d like to have a father to speak to.” Their paternal grandfather played that role for much of their youth. He was the one who helped instill a love of sports and helped with the day-to-day questions of growing up. When cancer took him before Bob Jr. was even a teenager, it devastated him. “I just lost the will to play,” he says. Avoiding the game wasn’t a conscious choice, but looking back on it, he knows his father’s looming legacy played a role. “As a kid, I’m not sure you consciously [avoid it], but I’m sure that’s probably true,” he says. Football was one place where he had a choice in avoiding the responsibility that came with his last name. In every other facet of his life, it was inescapable. “One of the things my mom always told us was that your name stands for something,” Bob Jr. says. “You’re a Kalsu, and you have a standard to live by. It helped me make a lot of decisions that were good decisions, but at the same time, that’s a lot of pressure.” It’s a pressure he managed well. Bob Jr. says his wife jokes that he didn’t have his first beer until law school, and after receiving his JD at Southern Methodist University, he’s spent much of the past 18 years practicing aviation law in Oklahoma City. It was as adults that the Kalsus finally got to see a more nuanced portrait of their father. Some of that was a product of taking on one of the responsibilities he had carried. “The realness of my father for me came later in life, becoming a father myself and understanding the conflict that had to be present for my dad, knowing that he was leaving a young family behind to live up to his obligation,” Bob Jr. says. “The difficulty of that for him, as a man now and as a father, it’s put into perspective how large of a decision that was, and how hard of a decision it had to have been.” Bob Jr.’s oldest was born about 14 years ago, at a time when a series of other events would provide a more detailed understanding — and a strange relief — for both him and his sister.